The freshly-laid eggs roll directly into the boxes provided. Each customer can take their own egg requirements from the green boxes provided at any time. If you find yourself with an empty nest, we ask for your patience. At the beginning, the young hens do not yet lay in large numbers, and also lay smaller eggs. The mobile henhouse offers space for a maximum of 450 hens (according to the laying hen livestock ordinance). 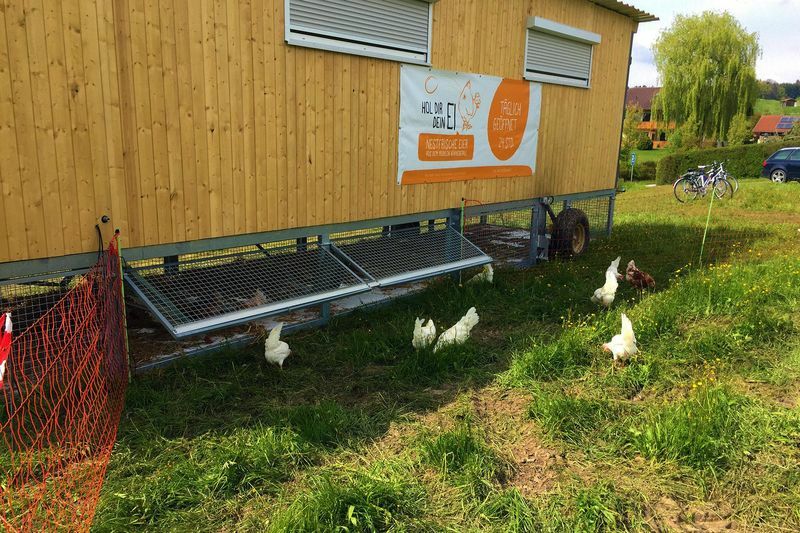 250 hens currently live in the henhouse according to the motto "more space - more animal welfare". In addition, the henhouse offers a conservatory below as a scratching room and a generous pasture adjoining it. The required energy for light, outlet flap etc. is fed into electricity storage tanks via a modern control system and an associated photovoltaic system. This means that the entire henhouse can be operated independently and in an environmentally-friendly manner. The feed is sourced GM-free from the region. In order to avoid overloading the freewheel, the mobile henhouse is moved as required. The henhouse is run by the Berger family.